London Wasps have signed Samoa international back Alapati Leiua for the 2014-15 season. The 25-year-old currently plays in New Zealand for Hurricanes in Super Rugby and Wellington in the ITM Cup. Born in Western Samoa, Leiua can play at wing or centre and has five Test appearances as well as two tries for his country. "We have been really impressed with what we have seen of Alapati," said Wasps boss Dai Young. "He will add power and pace to our backline options. "He is powerful, has good feet and knows where the try line is, and I am sure he will make a big impact here." 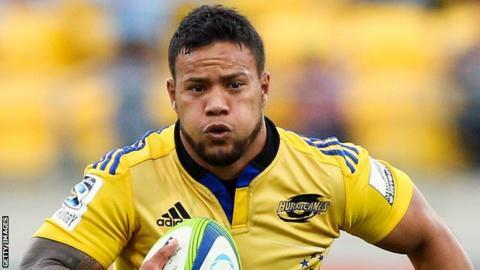 Leiua added: "After considering a number of options the decision to join London Wasps was made easy after meeting with Dai Young and hearing his vision for the future of the club." Wasps, who are chasing the Premiership's play-off spot for next season's inaugural European Rugby Champions Cup, have already signed Bradley Davies, James Gaskell, Rob Miller, Lorenzo Cittadini and Ruaridh Jackson for the summer.